As the fall is coming it’s again time for a relaxed west coast swing weekend with international teachers in Turku! This time Turku Swing Society is excited to welcome just incredible west coast swing teachers: Ani Fuller from.. Hmm… Originally from New Zealand but nowadays she spends most of her time in France! Her partner will be Ludovic Pelegrin from Switzerland. The other teaching couple is from Tampere / Lempäälä: Tuire and Markus Mast! And the energy on the dance floor is guaranteed by DJ Lauri from Helsinki! 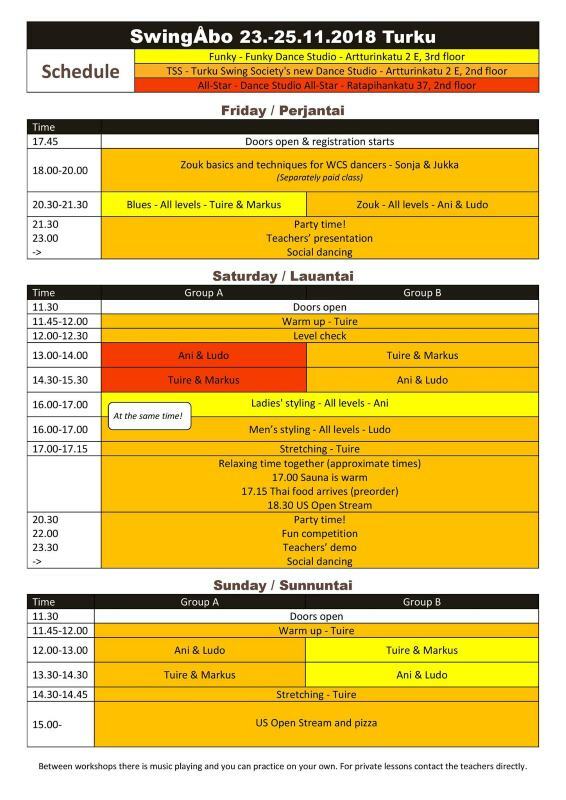 Workshops in 2 levels, 2 nights of parties, fun competition on Saturday night, amazing shows, nice atmosphere! PLUS we’ll watch US Open Stream together on Saturday and Sunday after the workshops! PLUS additional zouk basics and techniques on Friday evening! Ani is one of the few very talented dancers who is also very good and clear as a dance teacher. She has her own inspiring style to dance and somehow she can explain cool moves so that her students can also learn them! You’re going to love her teaching! Ludovic is known for his skills as a leader and also as a follower! He’s not afraid of using his talent to make the dance not only comfortable and variable but also a fun experience! On top of that, he is a very good teacher finding those crucial points that the students need to make their dancing better! Tuire and Markus Mast bring the needed spice from Tampere: if a workshop can be fun and technical at the some time, they know how to make it happen! Turku Swing Society loves to get them back as so many of you enjoyed their workshops two years ago! Detailed schedule will be updated here soon! The registration will be opened on this page on the 14th of October at 2 pm! All participants have to register for the event because we want to ensure a good balance between leaders and followers in the workshops. After you have registered, we’ll send you a confirmation e-mail as soon as we can ensure you a spot in the event. There will be details for the payment in the same e-mail. Parties are included in the workshops’ payment but if you’re not coming to the workshops, then the parties are payed with cash on the spot. The registration is binding. So there won’t be refunds without doctor’s certificate. Group A – You know the basics and maybe some variations so well that you do them in social dancing. You have danced from half a year to two years, maybe even longer but not so regularly. Or you simply feel more comfortable if the teaching is about simple variations and easy, fun musicality. Group B – You have danced more than two years and you’re seeking for more demanding technique and variations to use in your musicality. You have no problem dancing to really slow or fast music. You just enjoy challenging songs. You have travelled to other cities’ dance events or even abroad. There is going to be a level check on Saturday morning. There you can be moved into another group by the teachers if they think the other group would be better for you. The levels always change according to the people attending the event and to the subjects of the workshops. All the workshops and parties will be held in the same building at Saippua Center, Artturinkatu 2, main entrance (E) in Turku. - Turku Swing Society – dance studio on the 2nd floor is in our use for the whole weekend and as we have moved to a bigger ballroom (!) this time the main part of the workshops and also the parties will be held there! There’s a fridge, a microwave, coffee and tea, cups and cutlery for your use. There are also dressing rooms available all the time. - Funky – dance studio on the 3rd floor: some of the workshops during the weekend will be located here. There are also dressing rooms and a microwave available.